Facts about Leopard Seals. "Scientific name for Leopard Seal or Sea Leopard is Hydrurga leptonyx". It is part of the genus Hydrurga, which means water worker. Seals and sea lions and Walruses are semiaquatic mammals they are all in a group called pinnipeds, meaning "fin-footed". Leptonyx is Greek for small clawed. The Leopard Seal doesn’t have claws but large flippers similar to those of a sea lion. The leopard seal is the only species in this genus. Leopard seals live on the pack ice around Antarctica. They have been found on the Antarctic islands of Teirra del Fuego, southern New Zealand and Tierra del Fuego. 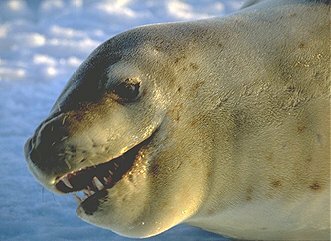 The Leopard Seal will hunt penguins and even smaller seals. They tend to wait in ambush near air holes and other high traffic areas, lunging at prey like crab and literally catching it by surprise. Because of this, the Leopard Seal rarely make long dives. They will eat sea birds and fish if they can catch them. The Leopard Seal pups feed on krill. Adults, too, can sieve krill from the water with their molars when locked together. The only thing the Leopard Seal have to fear is being eaten by a killer whale. The Leopard Seal has not been hunted by humans. Nor are they adversely affected by fishing, since there is little human fishing in their territory. Leopard seals have a long slender body's. Their back is dark grey, while the throat is white with dark spots. The under belly is lighter than the top of their bodies. Grown leopard seals are eight hundred to a thousand pounds (362 to 454 kg) and up to ten feet (3.04 meters) long. Females are larger than the males. The Leopard Seal have nostrils on the top of their snouts, a trait that looks more reptilian than mammal. Leopard seals are solitary animals except at mating time. Females give birth to their pups in the Antarctic summer, during November and December. The pup weighs sixty to seventy pounds (27 to 32 kg) at birth and doubles that by the time it is three months old. There is no agreed upon population figure for the leopard seal or its primary prey, the crab-eater seal.